The aircraft was now settled into its final resting place -a dry field. The nose gear collapsed, and the fire is beginning to engulf the aft part of the fuselage, climbing upwards towards the #2 engine. Business Class and First Class still unaware that fire exists in the main cabin.Karen Lacey, a tall blond Flight Attendant ( who was commuting home, seated between the #3 emergency exit doors and next to another commuter Eunice Wong), unfastens her seatbelt and leaps up and begins moving down the aisle towards First Class. Karen is shouting loudly MOVE, RUN, GO FORWARD, GET OUT NOW! Her voice booming throughout the cabin. Passengers are frozen, in a state of shock, not moving. Karen literally begins to grab passengers by their collars, lifting them out of their seats and throwing them into the aisle. The benefits of Karen's loud voice later was credited with saving many of those trapped in the coach section of the aircraft. Her voice carried throughout the cabin and people realized that they could run forward and escape. Paula Guice-Williams, seated next to the right side #4 door, knows that her side of the airplane is engulfed in flames - her emergency exit cannot be used. A passenger runs to her door to try to open it - Paula pushes her back telling her that the door is not usable - run forward - there is too much fire outside. Then Paula turns to tell Joanie Agosti not to open the left #4 door - fire! Too late - Joanie could not see out the tiny view window on the emergency exit - she pulls the T-handle. Door opens, smoke and fire now start to fill the cabin.Sheri Bencini, seated at the left #3 exit door, pulls her T-handle and her door is now open. Both slides exploded upon deploying - trapping 50+ passengers in the rear of the aircraft. Now the flight attendants in the rear of the plane could not see anything. Smoke was filling the cabin and it was only a matter of seconds and the fire would soon engulf everyone. Karen's booming voice was heard by those in the back and the crew knew moving forward was the only way out. Until that point Paula did not know if the entire plane was on fire or just fire in her area. Passengers were still trying to get out the back exits and they were blocking Paula and Joanie. 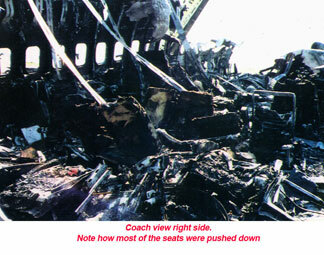 Paula quickly begins to push her passengers forward telling them to run over the collapsed seatbacks. She uses her flashlight to guide the passengers and find a way through the smoke filled cabin. Joanie feared her slide might open in the cabin itself. For a brief second it teetered back and forth, finally falling out, opening only to explode from the heat. But the slide did keep the smoke and fire out of the cabin for the few precious seconds needed. Joanie began to direct her passengers to run forward - past the flames at the #3 left door. Eunice, commuter seated between doors #3, is up and yelling at the passengers on the left side to to run forward. She is pushing them past the open #3 left exit as is Sheri. Hopeful the last passengers in the aft section are gone Joanie and Sheri both run to the front of the plane -praying they still had a few precious seconds to save themselves. The Flight Attendants in the back could not see anything as the smoke has now completely filled the cabin.Chris Kargle-Foster, who was the Flight Attendant pinned under the passenger, somehow managed to free herself and started directing others to run forward, only to be shoved into the right aisle between seats - she now crawled forward by way of seat back to seat back - always yelling move - run! She really did not think she had much of a chance of surviving as the fire and smoke now filled the aft of the cabin. She couldn't see anything and feared she might be overcome with smoke inhalation. As she arrived at the #2 door right side - it was open with fire leaping into the cabin. The slide was completely burned away, and passengers were attempting to jump into the flames just to get free of the airplane. Chris blocks the #2 door and yells at the passengers to run forward. Seconds later Paula shows up at the #2 right door and helps Chris move people forward. . They teamed up and did a full body block in front of the open door, fire on their backs - forcing the passengers go forward, preventing the passengers from jumping out, possibly even jumping to their death. Once they felt everyone in their area was out - Paula and Chris run for their own lives and exit out the #1 right door. 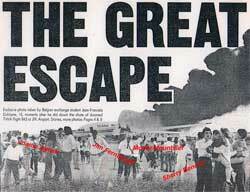 As Paula steps onto the now collapsed slide, she suddenly finds herself covered in a white foamy mess - it's the spray the Fire department was using to put out the fire.Eunice Wong, seated between the #3 doors, next to Karen Lacey began to yell and scream at passengers to run forward, past the open #3 left door. She knew that the passsengers were scared and afraid to pass the open door, smoke and fire beginning to fill the cabin - she began to push them forward in hopes the forward part of the aircraft was not engulfed in flames. Rose Berardelli, the Flight Attendant seated at the #2 door left side, could see the fire in the main cabin because her crew seat faced aft. She was not sure if the fire had worked its way forward, to her emergency exit, she was unable to tell if her door was a usable exit. Rose and Aleta Smith, the Flight Attendant seated between doors #2, instantly decided to team up - one going forward to look out a passenger window and the other ready to pull the T-handle if it was safe. Rose moved forward into business class and looked out a passenger window, to see if the left wing was on fire. 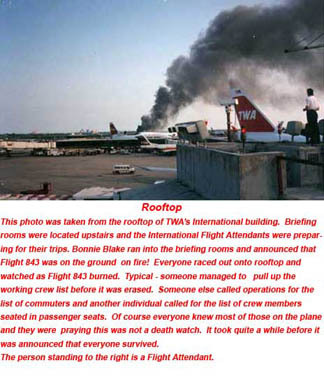 The fire was burning behind the left wing, still in the tail section of the plane - Rose could see that they had a usable emergency exit. . Rose then signaled Aleta to pull the emergency T-handle.As Aleta opened the emergency exit - passengers, in their panic to get out - pushed her out the door. The slide had not yet deployed and Aleta was suspended midair with a 15 foot drop below. Years of training saved Aleta. 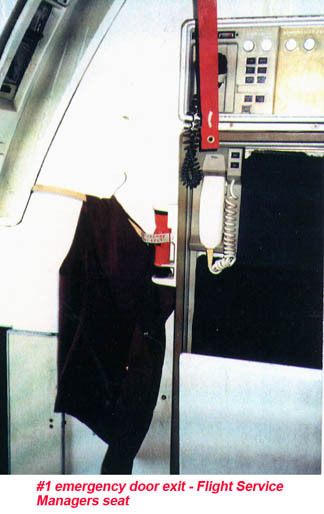 TWA had always trained their Flight Attendant's to hang onto a safety handle, located next to the door, and it was this training that saved Aleta. She somehow managed to pulled herself back into the cabin - then the evacuation began at the #2 left door.Once the left #2 exit was open, the passengers, in their panic to get out began to jam up at the exit door. 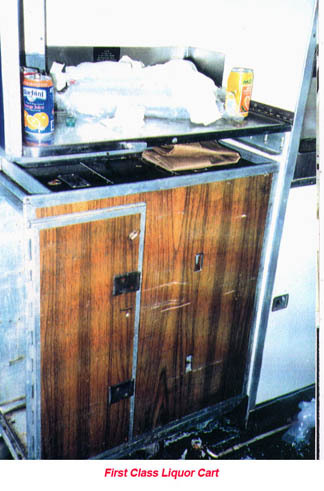 Marilyn Kregel, Flight Attendant and another commuter was seated next to Aleta, sharing a Flight Attendant jump seat between the #2 doors and in front of the galley lift doors. Marilyn positioned herself between the #2 right and #2 left emergency exit doors and kept pushing the passengers to move forward down the right side to the #1 right exit door. Passengers wanted to evacuate at the nearest exit possible. Those who were coming from the back right side wanted to get out and get out fast. Marilyn kept forcing those on the right to go forward to the right front exit. Passengers, in their panic to evacuate, could have created a massive a bottleneck in this area, others in the back might never have gotten out. Because of Marilyn, the bottleneck never occurred.Barbara Furman, seated at the #2 door right side, knew her door was not a usable exit - she could see the fire under the right wing. 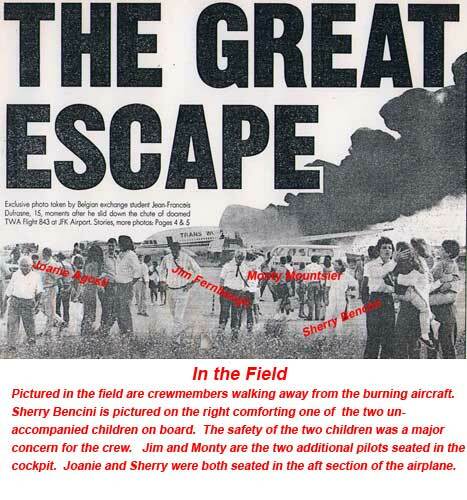 As the plane begins to settle into the field, Barbara runs up to First Class to tell Teri Hawn that there is fire outside of the plane and the #2 right exit is not a usable exit. Barbara and Teri work together to open the #1 right emergency exit door and evacuate together one on each side of the #1 right emergency exit door. 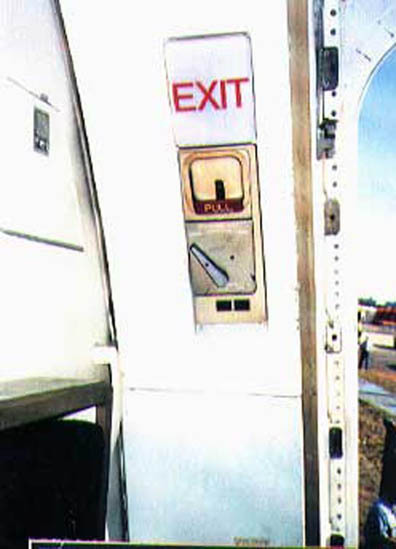 The #1 right door was the ONLY emergency exit usable on the entire right side of the plane. Door open, Teri and Barbara began to move passengers out the door as fast as possible – never knowing at what point the plane could explode. 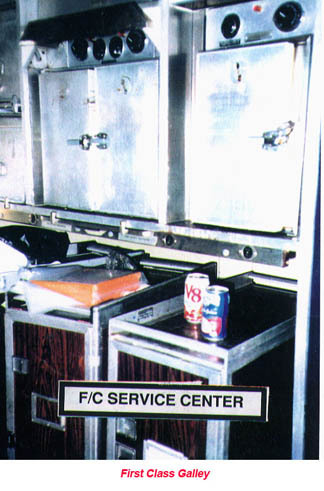 At the #1 left door was seated the Flight Service Manager, Ed Schwendner. He was trying to get back into his crew seat when the plane came to an abrupt halt, nose gear collapsed. Seconds earlier Ed had seen the eerie orange glow in the main cabin emanating from the fire outside. He also saw the passengers in the aisle and running forward.Once the plane stopped, all was quiet - except for the groans and moans of equipment bending and breaking - passengers in the forward cabins were silently waiting for direction. Ed scrambled to his feet and ran to the #1 door left side and pulled the emergency exit door open. In slow motion the slide unfurled as each grommet popped with the whoosh of the slide inflating - another usable exit. As the nose gear had collapsed, the distance from the door sill to the ground was only a couple of feet, so passengers could literally run down the slide to safety - the slide was more of a walkway. Mary Ann Burns, the Flight Attendant seated in First Class, row 3 aisle seat, another commuter on her way home, stood to the left of the exit, working with Ed to move passengers out - fast! Mary Ann later runs down the slide to grab a newly lit cigarette from a most unaware passenger. Jet fuel igniting was a major concern.Eunice, was one of the last to evacuate through the #1 left front emergency exit door. As she arrives, an elderly couple are hovering over the slide and debating on how best to evacuate but they are also blocking others from evacuating. In the midst of their debate they are suddenlygiven a a swift Karate kick to the back of the knees by Eunice and down they all go. The pilots were in trouble- when the nose gear collapsed, it had dislodged one of the extra jumpseats along with the pilot who was sitting on the seat. 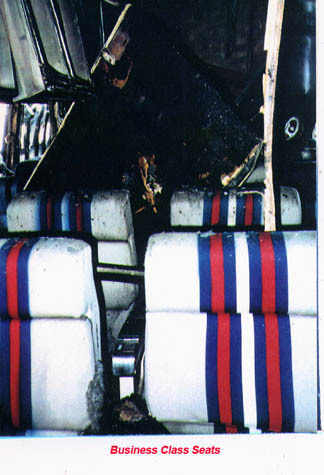 Monty Mountsier, commuter seated in the aft second of two pilot jumpseats, was now pinned under the jumpseat, face down with a large gash on his arm, and his seatbelt wrapped around his neck. His seat was also blocking the cockpit exit door. Quick teamwork, the Chuck Long, Flight Engineer and Jim Fernbaugh, another commuter, managed to get Monty untangled, freeing up the cockpit door and themselves.Somehow in the middle of all of this chaos - Captain William Kinkead manages to announce on PA system to evacuate the aircraft immediately. Just before leaving - as is habit - Captain Kinkead put on his Captain's hat - later he laughed as to what purpose the hat may have served, but training had always been to wear the hat for visual identification.Now for the biggest shock of all - the pilots had no idea until they actually left the cockpit that their airplane was engulfed in flames and only 3 exits were usable. They were aware that fire existed, but could now see and smell the smoke moving into the First Class cabin. Captain Kinkead moved as quickly as he could towards the tail section of the airplane, looking for any passengers that needed his help. He stopped at the #2 left door to help Rose, Aleta and Marilyn, evacuate passengers. Time was of the essence.Chuck, the Flight Engineer, stationed himself mid cabin First Class, to move passengers out the exist and eventually battle with passengers over their carry-on luggage. The bags could block the exit and possibly causing serious injuries to others if anyone tripped on the bags. Surprisingly, Chuck found himself, along with the aid of another Flight Attendant, fighting with a passenger who insisted on dragging out a giant tusk hat - (some people just never get it). In fact three crewmembers actually fought with this passenger and his antler hat. Rose had actually taken the tusk away, tossed it into the middle of a Business Class aisle, only to have the passenger crawl over seats to retrieve the item. Chuck also fought with this same fellow over the tusk. Chuck and Rose both feared that the tusk could injure someone or destroy the slide.After the evacuation all of the crewmembers commented on passengers taking the time to retrieve their personal belongings from the overhead bins. What could possibly have been in those bags that was so valuable it was worth rising one's life.One woman, who did not speak English, decided to throw her body down in the middle of the First Class galley, legs and arms flailing about - screaming frantically. Crewmembers physically picked her up, pitching her out the emergency exit. Monty and Jim, the two additional pilots seated in the cockpit took positions at the bottom of slides #1 and #2 on the left side of the plane. The left #1 slide was starting to deflate, and the flat angle of the slide made getting off very difficult. Jim and Monty both grabbed the passengers as they came down and moved them away from the slide area. Potential for injury was great, and it would only have taken one passenger to create a horrible pile-up. Captain Kinkead then moved into main cabin area, looking for anyone who might need help. Smoke and fire now completely filled the main cabin. He looked into the main cabin as far as he could possibly see and prayed that no one was left behind. Captain Kinkead knew it was impossible to go any further.Capt. Kinkead was the last person to leave the aircraft. © 2004 E. Kaye Chandler. Printing file duplication or Internet publishing is prohibited without prior written permission from the author.